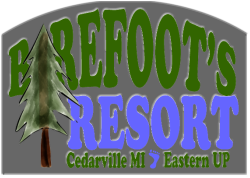 Barefoot's Resort is located in the heart of the beautiful Les Cheneaux Islands, minutes from the village of Cedarville, and convenient to the many attractions of Michigan's Eastern Upper Peninsula. 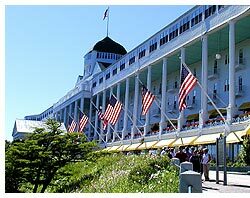 The resort setting is ideally suited to many of of your favorite lakefront activities, or you may choose to simply relax and enjoy the serene beauty of our pristine environment. 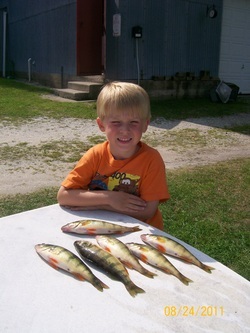 Veteran anglers who frequent Barefoot's Resort regularly bring back their limit of yellow perch, and have seen more than their share of northern pike, large and small mouth bass, the elusive "muskie," as well as Lake Huron salmon. Others prefer to do some casual pan fishing right off the dock. During the heart of summer, our protected channel offers outstanding conditions for water skiing, jet skiing and kayaking. Close to the cottages, our clean, sandy beach is a great spot for children of all ages to swim. Nightfall is a quiet time at Barefoot's Resort, when guests typically gather for the traditional evening campfire and await a brilliant display of stars. As the cooler breeze of early autumn arrives, an even more relaxed pace transforms the Les Cheneaux. Migrating geese honk overhead, the maples adopt their hues of red and gold, and the salmon begin their annual trek upstream. Whether spring, summer, or fall, we invite you to experience the distinctive seasons of Barefoot's Resort.